ClassicalRealist.Org: Does Chris Peters Have A Few Sketetons in His Closet? Does Chris Peters Have A Few Sketetons in His Closet? This month, artist and friend to ClassicalRealist.org, Chris Peters, is presenting "The End and After" from August 9 - 30, 2008 at the Copro / Nason Gallery in Santa Monica, CA. Chris is known for his Vanitas style paintings, one of the few who persue that genre with any consistency. Of his work the gallery says: "Chris's paintings try to find the beauty in that uneasy twilight place between life and death, between reality and unreality, between self and what the write H.P. Lovecraft called "the others". 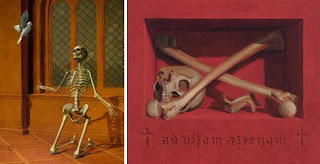 The objects in the paintings draw from the classic symbolism of Vanitas stil life and catholic religious paintings; and all refer to the cycle of life, death and the promise of ressurection. The Germans have a word "unheimlich" which translated is a blur between "uncanny" and "eerie" and perhaps comes the closest to describing Chris's work." All our best from ClassicalRealist from what we are sure will be a great show.